It’s actually an entire Virginia weekend!! 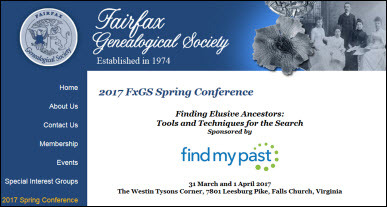 The Legal Genealogist is off to the Old Dominion today for the Fairfax Genealogical Society 2017 Spring Conference in Falls Church, which gets underway at the Westin Tysons Corner this afternoon. If you’ll be there today, you have eight tracks to choose from, with presenters like Dr. Thomas Jones and Kathryn Lake Hogan. Tomorrow, another eight tracks ranging from something called Courting Virginia: Understanding the Old Dominion’s State and Federal Courts (bet you can’t guess who the presenter is for that one…) to African-American Research – Slave Records, presented by Char McCargo Bah. And always great to head off into the statutes in preparation for a talk. And that same statute we looked at yesterday2 had some other words we don’t use a whole lot now or that don’t mean quite what we mean when we use them now. The Legal Genealogist‘s work is never done. Um… no. Not in the law. In other words, just as one example, the right to collect rent is a tenement. And that other word … “hereditaments”? Things capable of being inherited, be it corporeal or incorporeal, real, personal, or mixed, and including not only lands and everything thereon, but also heirlooms, and certain furniture which, by custom, may descend to the heir together with the land. The two kinds of hereditaments are corporeal, which are tangible, (in fact, they mean the same thing as land,) and incorporeal, which are not tangible, and are the rights and profits annexed to or issuing out of land. Gotta love the language of the law… in Virginia as well as everywhere else. My favorite word from the old deeds is Appurtenance. While you are on Virginia, do you know which state court records were lost in the 1865 Richmond fire? The law of our land is words and words used in different context can mean many different things. So, I asked an attorney friend of mine one time “How do you keep up with all this stuff”. He said simply “you don’t, you just have to know where to look it up”. Somehow I think he oversimplified the nature of law business.